From the sweet, loosely-packed leaves of ‘Spring’ Cabbage early in the year through tight-pointed ‘Hispi’ in the summer to the stronger flavoured, tightly-packed heads of crinkly ‘Savoy’ in winter, no wonder there are so many ways to use a Cabbage. In the wild, Cabbage originated in Mediterannean coastal areas. Its thick, waxy leaves stand up to the salty, sunny climate. Wild cabbage grows by the coast in Northern France and the UK too and was eaten by the Celts before the Romans introduced cultivated varieties. Jane Grigson describes the wild cabbage as “very nasty indeed”. Its domestication 2,500 years turned it into a vegetable that is tolerant of cold climates and turned it from something which may have been eaten as a medicine – the old addage ‘if it tastes bad, it’s good for you’ – into palatable food. The Cabbage family is quite various. Members of Brassica oleracea include Kale, Black Cabbage, Collard Greens and Portuguese Tronchuda, all of which resemble the wild cabbage in that they bear separate leaves along a fairly short, thick main stem. The Cultivated Cabbage, which we are focussing on here, forms a head of closely nested leaves at the tip of the stalk. All have various degrees of pungent sulfurous characterists producing a bitterness that isn’t to everyone’s taste. Children almost always dislike the taste but, like a rite of passage, most of us learn to love it. We have to mention here Brussels Sprouts, which were developed from the cabbage. Producing many small tight heads around a long stalk, they are the bitterest of leaves in the family. The challenging compounds being concentrated in the centre of the sprout, many cooks advocate cutting them in half before boiling to allow this bitterness to leach out – which does explain why many of us have memories of being served soggy sprouts at the Christmas table. There are Asian cabbages (Brassica rapa) too, Chinese Cabbage being the most obvious but including Bok Choy and its variants. 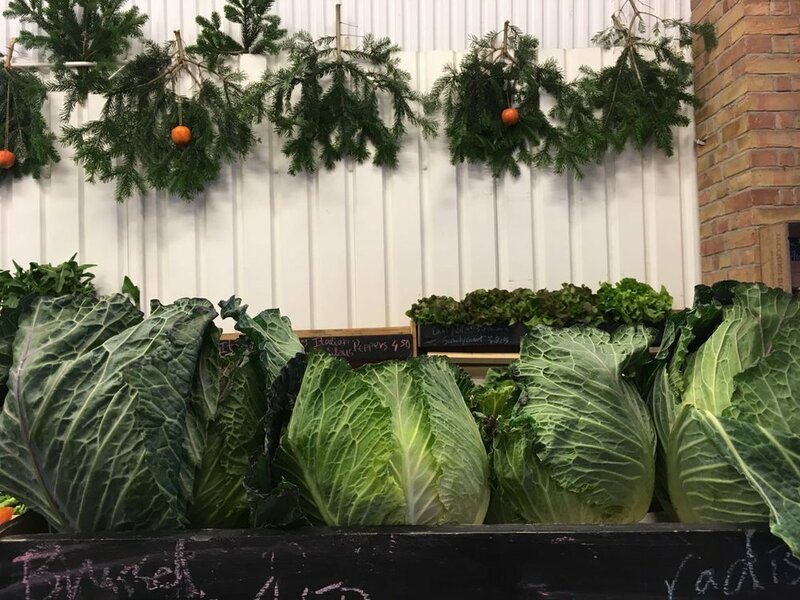 There are so many varieties of domesticated Cabbage, from smooth to deeply ridged, ranging from white through green to deep red and, in the case of the ‘January King’, eye-catching pale and dark green with purple markings. In spring and summer the sweetness of cabbage can be appreciated eaten raw in Coleslaw. Cooked well, cabbages have great texture and a sweet, spicy flavour. They have an affinity with juniper and caraway. Cream tempers their bitterness. Mustard, soy sauce or Worcestershire Sauce peps things up nicely. Here we have a few favourite dishes using cabbage: Bubble and Squeak (traditionally, fried beef and cabbage), Champ (buttery mashed potatoes mixed with greens including cabbage), and Irish Colcannon (fried potatoes, cabbage and onion) being variations on a theme. Cabbage stands up particularly well to the strong flavours of duck, pork and game. There’s a hearty soup from southwest France called Garbure which demonstrates the virtues of long-cooked cabbage: generally cabbage, onion, leek, turnip, carrots, potatoes, salt pork or green bacon and confit duck or goose leg, it is cooked gently for anything between 2-4 hours. The French also have Chou Farci: stuff a whole, blanched, cabbage with fried minced pork, or chopped roasted chestnuts, and poach in a vegetable stock. Impressive, but an easier version is to blanch individial leaves until pliable enough to use as wrapping for the stuffing then poach the parcels in stock. And, of course, you can ferment cabbage into Sauerkraut. Slice and wash a firm cabbage. Put 2cm of water in a pan and bring to the boil. Add the cabbage and boil until just cooked (around 5-6 minutes). Drain and cool in a colander. Squeeze out the moisture and chop fairly finely. Return to the pan, mix in the cream, heat through gently, season with salt and pepper. Allow everyone to help themselves to a sprinkling of sugar/cinnamon to their own taste.